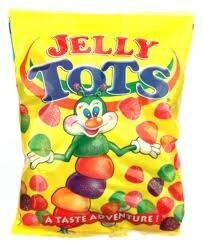 Jelly Tots are soft, chewy fruit-flavoured sweets produced by Rowntree's. They are round, sugar-coated gumdrop-like confections about 7mm in diameter, and are advertised as containing 25% fruit juices and no artificial colours or flavours. According to the packaging, Jelly Tots are suitable for vegetarians or vegans as they contain no gelatine or animal-based ingredients.